Our series offers wines made from individually selected barrels of our pinot noir with exceptional character and interest. Intended for true connoisseurs of pinot noir, each bottling of wines represents the epitome of wines to be made from the Dijon clones in our Yamhill vineyards. Our 2012 comes from the most engaging barrel of wine that we made that year using a multi-clone fermentation of Dijon clones 113, 114, and 115. From 2013 onwards, when we adopted single-clone fermentation and barrel aging processes, our wines represent the best barrels of each individual clone harvested in our vineyards. The wines selected each vintage for each clone may have undergone aging in new French oak, second-use oak, or a neutral barrel, depending on which combination of wine and barrel gave us wine of the most notable character each season. The cellaring horizon for each wine varies with the kind of barrel that hosted the wine, ranging from seven to ten years for neutral-barrel wines to a decade or more for wines aged in new French oak. The single new French oak barrel of three-clone fermented wine selected for our 2012 Singularity shows a lean tannin structure and lovely French oak spices that perfectly complement the deep fruit flavors in our 113, 114, and 115 Dijon clones. 22 cases produced. Released in July 2015. The Dijon clone 113 vines in our vineyards provide an elegant balance of pinot flavors and tannin structure. The 2013 – Clone 113 offers warmer-season fruit flavors that have been integrating beautifully with the wine’s tannin structure during the 15 months spent in new French oak barrels and the time spent in cellar since being bottled in March 2015. We expect the 2013 – Clone 113 to be a confident, well-balanced wine with a complex structure and extended spectrum of summer berry flavors that will please the most discriminating palette. Only 23 cases produced. The Dijon clone 114 vines in our vineyards provide refined, early summer berry flavors. The 2013 – Clone 114 is exhibiting delicate berry flavors enhanced by a light tannin structure. We expect the 2013 – Clone 114 to mature into an elegant, nuanced pinot wine with a memorable marriage of flavor and structure. Only 23 cases produced. The Dijon clone 115 vines in our vineyards provide intense berry flavors accentuated by a distinct tannin structure. The 2013 – Clone 115 is already exhibiting intense up-front summer berry flavors with a velvety middle and lingering spices on the finish. 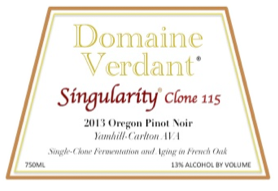 We expect the 2013 – Clone 115 to be one of the best wines to come out of the Oregon 2013 vintage. Only 23 cases produced. The perfect 2014 growing season let our Dijon Clone 113 vines show what they are capable of producing, and the result promises to be an extraordinarily vivacious and captivating pinot that only the classic 113 clone could provide. The 2014 – Clone 113 was bottled in September 2015 after aging 10 months in new French oak. We expect this wine to reach maturity in mid to late 2017. Only 25 cases produced. The 2014 – Clone 114 shows an amazing breadth of fruit flavors, from summer berries to apple and pear, with aging in new French oak eliciting a progression of spices on the finish. We expect this wine to reach its maturity in mid to late 2017. Only 50 cases were produced. The perfect 2014 growing season let our Dijon clone 115 grapes develop an amazing range of berry flavors, with an intensity rarely found in a cool climate wine. We believe the 2014 – Clone 115 will be a landmark wine from what may be the best vintage in 50 years of pinot viticulture in Oregon. We expect this wine to reach maturity in early to mid 2017. 75 cases were produced.